In a record breaking 244 steps, the World's largest Rube Goldberg Machine by students at Purdue University blew its onlookers away at a competition in March. With the end goal of watering and growing a plant, the Purdue Society of Professional Engineers' "Time Machine" traces world's history beginning at the Big Bang, then documenting monumental human endeavors along the way until an ultimate apocalypse. After the humorous destruction of the world, the machine's last act is one of regrowth that simply grows and waters a plant. Mischievous, clever, fascinating and yet entirely over complicated, the record breaking machine is sure to delight. 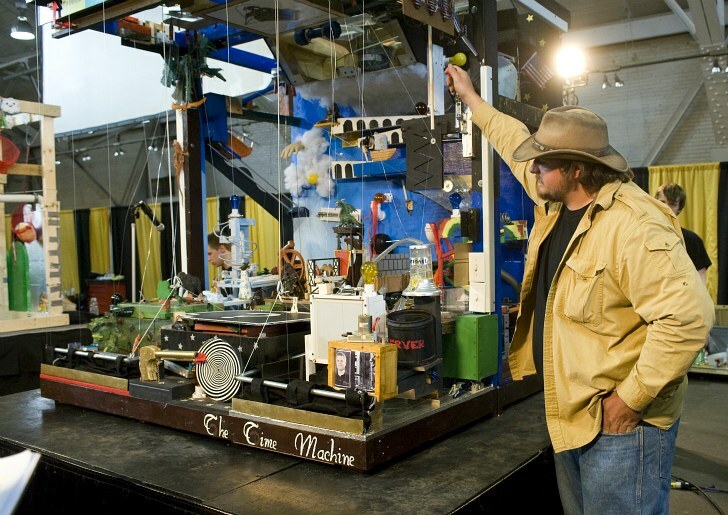 In March the 2011 Rube Goldberg Machine Contest was held at Purdue University, where they threw down and won not only the competition, but also the Guinness Record for the largest Rube Goldberg Machine. The Purdue team apparently has a lot of creativity plus a green thumb, because the ultimate task of the machine was to water a plant (and keep it alive!). Each year the team chooses a new theme for their machine and this year’s theme was “Time Machine” and traced the often disastrous path of history starting from the Big Bang. The beginning of the world then led to Evolution, an Ice Age, the Stone Age, Ancient Egypt, the Medieval Era, World War II, The Cold War and the Technical Revolution. Along the way, the world is destroyed by a meteorite, a massive flood and then the Apocalypse triggered by the Four Horsemen: Bob Barker, Dirty Harry, Darth Vader, and Woody the “Toy Story” cowboy. After 244 steps, water shoots from a hose to water a plant which springs up out of a mystery box. The 17 member team, which was led by Zach Umperovitch, spent a total of 3,500 hours designing, building and testing the machine, which fits inside a compact 6 ft cube. The record breaking team is also rumored to be building a massive Rube Goldberg machine for an undisclosed client, which we hope to see in the next year. “If Bruce Willis, Will Smith and Charlton Heston joined forces to build a Rube Goldberg machine, this is what it might look like,” quipped Zach Umperovitch, captain of a team that has also won three national championships and set two world records in the past seven years. “Of course, those guys wouldn’t be as crazy as we are to invest 3,500 hours to accomplish a task a toddler can do in mere seconds.” Congrats to the Purdue team on their accomplishment and their success in keeping one plant alive. We like their message that even if the world is destroyed, it can regrow. Purdue Society of Professional Engineers team members watch anxiously as their world record-breaking machine competes at the 2011 Rube Goldberg Machine Contest. In March the 2011 Rube Goldberg Machine Contest was held at Purdue University, where they threw down and won not only the competition, but also the Guinness Record for the largest Rube Goldberg Machine. Evolution of the Time Machine, construction in early December. The Time Machine makes progress into mid-January. First coat of paint in mid-February. The Purdue team apparently has a lot of creativity plus a super green thumb, because the ultimate task of the machine was to water a plant (and keep it alive!!). Each year the team chooses a new theme for their machine and this year's theme was "Time Machine" and traced the often disastrous path of history starting from the Big Bang. The beginning of the world then led to Evolution, an Ice Age, the Stone Age, Ancient Egypt, the Medieval Era, World War II, The Cold War and the Technical Revolution. Along the way, the world is destroyed by a meteorite, a massive flood and then the Apocalypse triggered by the Four Horsemen: Bob Barker, Dirty Harry, Darth Vader, and Woody the "Toy Story" cowboy. After 244 steps, water shoots from a hose to water a plant which springs up out of a mystery box. The 17 member team, which was led by Zach Umperovitch, spent a total of 3,500 hours designing, building and testing the machine, which fits inside a 6 ft cube.